Russian lawmakers want to stop foreign subsidiaries from providing temporary staff to Russian companies. The initiative has already been endorsed by Russian trade unions, but it will cost Western temp agencies, who supply thousands of temporary workers to Russia annually, a large chunk of revenue. Russian experts are split on whether or not the proposed temporary labor bill is appropriate and beneficial. Andrey Isayev, a member of the ruling United Russia party and chairman of the State Duma Labor Committee, has proposed the idea of restricting the operations of foreign recruiting agency subsidiaries. He wants this restrictions included in his new temporary labor bill. This will be one of the measures to be taken in response to the U.S. Congress passing the Magnitsky Act, Isayev told a roundtable at the State Duma in early December. As Isayev explained, it was American companies that exported the notion of temporary work to Russia, even though the American Chamber of Commerce was the first to protest against this temporary work bill. Isayev believes domestic employers are the ones that must take care of temporary workers’ rights. Trade unions have already endorsed the initiative. The secretary for the Federation of Independent Trade Unions, Aleksander Shershukov, noted that trade unions had called for a ban on temporary labor before. But restrictions on foreign recruiters will deal a blow to an already mature market. According to Dmitry Potapenko, managing partner at Management Development Group (the group includes Gastronomchik, Prodeco and other chains), the bill will not outlaw temporary labor altogether: What will follow are a redistribution of the market, strict government controls and a rise in costs of those services for businesses. 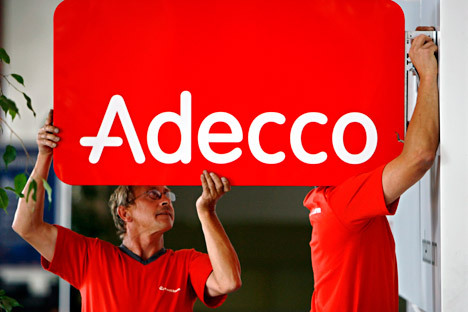 Of the “Big Four” recruiting companies – Kelly Services, Adecco, Manpower and Ancor – only Ancor has no foreign founders. Kelly Services CEO and chairperson of the Association of Private Recruiting Agencies Subsidiaries, Yekaterina Gorokhova, noted that international recruiting agencies have long been working in Russia as Russian legal entities. According to Gorokhova’s estimates, out of the 70,000–100,000 temporary workers, 40,000 are hired through Western agencies, which will lose a substantial chunk of revenue. According to Ancor CEO Sergei Salikov, these estimates are too conservative ‒ they only include personnel provided on a year-round basis. His company provides approximately 10,000 temporary workers per year on 12-month contracts and another 80,000 per year for shorter terms. Although the Trade Unions have endorsed the initiative, not everyone is on board with Isayev’s bill. A staffer in the presidential administration is confident that this is Isayev’s personal initiative and that the Kremlin will not support it. Presidential spokesperson Dmitry Peskov has no idea how Isayev’s proposal relates to the Magnitsky Act. United Russia parliamentary faction deputy head Nikolai Bulayev is not familiar with the initiative, and his faction has not discussed it. Restrictions on companies’ operations cannot depend on who their shareholders are, believes Ministry of Labor representative and deputy prime minister in charge of social affairs, Olga Golodets. Isayev’s initiative will harm foreign businesses rather than officials, and it undermines the government’s efforts to attract foreign investors, said Sergei Belyakov, deputy minister of economic development. First Deputy Prime Minister Igor Shuvalov said in early December that the situation surrounding the Magnitsky List would not affect business ties. When taking measures against foreign businesses, the impact on the interests of Russian entrepreneurs have to be considered, a government staffer advised. "The State Duma’s response to the enactment of the Magnitsky List in the United States should be collective and non-partisan. [The U.S. Senate’s resolution is] a show in a theatre of the absurd, that would have a rather negative effect on the outlook for bilateral cooperation." “They still can’t decide if the names of the people blacklisted in the act should be released or not. That’s the first thing. The second thing is even funnier. The guy who sponsored this act, Senator [Benjamin] Cardin, wanted it to be about human rights all over the world, not only in Russia, so that the act could be applied this way. But here came lobbyists from the business and non-business world who complained that their interests would get hurt, that the United Sates’ interests would suffer. So what happened in the end? You guessed it. It only concerns Russia. Thirdly ‒ and I’ve said this before ‒ 99 percent of congressmen and senators couldn’t care less about our rights here. This is a purely domestic document and nothing more. It will have no effect whatsoever on Russia. It’s only that perhaps certain nice folks will stop keeping their money in American banks and use U.S. dollars for settlements." “They might respond in a way that could seriously spoil relations between the two countries. My concerns were misplaced: They responded symmetrically. We will blacklist the same number of people the Americans did. Our list will include people who we believe are responsible for human rights violations in America. They will be banned from entering Russia, their accounts in Russian banks will be frozen, and they won’t be able to spend rubles. This is all very terrible, of course,” he added sarcastically. "As they prepare an adequate response to the unfriendly affront by American lawmakers, Russian government officials are, above all, concerned that this resolution is setting a rather unpleasant precedent – a precedent of non-judicial punishment. It is as if the West has forgotten all about the “presumption of innocence,” which entered the Russian language as a popular “meme” in the Perestroika era and epitomized the superiority of Western jurisprudence over the Soviet repressive and punitive system. What consequences will the Magnitsky List have? Russian-American relations are unlikely to change much, but, without a doubt, the regime of shutting out Russian officials will become stricter ‒ i.e., the attitude toward such “good life” attributes as foreign deposits and real estate, or sending children to foreign universities, will become less favorable. Consequently, they will need to make life “good” inside the country rather than abroad. Many will have to take their holidays in Sochi, like in the old days. Perhaps in such a convoluted way, U.S. Senators will help encourage investment in Russia’s entertainment business."